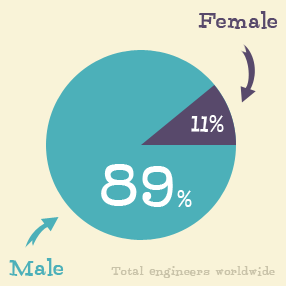 A Stanford Engineer, Debbie Sterling, seems to have discovered a big part of the reason why there aren’t as many female engineers, programmers, etc. Most of the toys designed for girls are pink and stereotypical. Boys get to play with Legos, trains, and construction toys while girls are stuck with pink princess stuff and Barbies. Debbie started designing toys to build more spatial awareness among other skills required in today’s workplace. It seems her ideas break the mould of what society tells us it means to be a woman, and offers young women tools to build a new mental makeup, and become the engineers of the future. GoldieBlox even made a video that’s gone viral which is a parody of the Beastie Boys’ song, Girls. You think you know what we want, girls. Pink and pretty it’s girls. Just like the 50’s it’s girls. and we’ll grow up like them… false. We deserve to see a range. and we would like to use our brains. We are all more than princess maids. That’s all we really need is Girls. To bring us up to speed it’s Girls.